Plunyon Kalikuning is a famous natural area in Indonesia. Locals often visit this place on weekends to feel closer to nature. 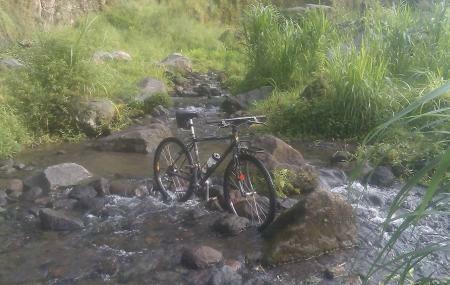 Tucked away in lush greenery, rocky patches, huge trees, and small hills, it is a perfect place for bikers and hikers. A couple of small streams passing through this terrain make the landscapes even more charming. You cannot resist clicking photos of this natural beauty. If you are looking forward to escaping a chaotic city for a day, this is the place to be! An ideal Cangkringan trip includes top things to do in Cangkringan like Bumi Perkemahan Gondang 2 Indah and Desa Wisata Petung. Explore Plunyon Kalikuning and other prime spots of the city using Cangkringan trip planner. Hotels like Joglo Ayem Tentrem, Rumah Mertua Boutique Hotel & Restaurant and Lokal Hotel & Restaurant will solve your problem of where to stay in Cangkringan. Find out how to reach Cangkringan to begin with. Plenty of wholesome Cangkringan vacation packages are available to choose from, pick your today! A nice place to enjoy nature. Best during morning between 7 to 10 am. In the morning you can see Merapi Mountain from here.